A 10% rebate is on total registration fees is paid back to families who register 3 or more athletes from the same family. A significant portion of these fees are paid to Little Athletics Queensland (LAQ) to cover athlete insurances. Our fees reflect the fees set by LAQ. NO child will be covered by Insurance or a result recorded unless a registration payment has been received. 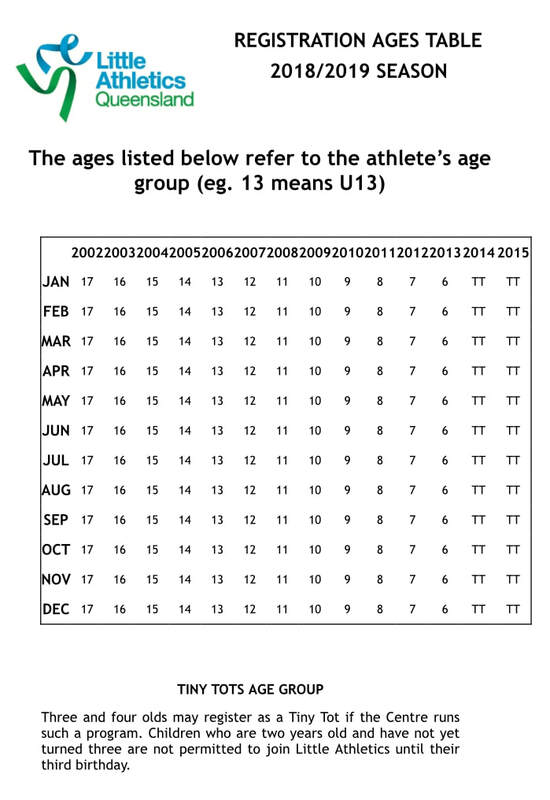 The table below shows the age group children will compete based on their date of birth. NOTE - IF YOU ARE AN EXISTING OR PREVIOUS MEMBER OF HIGHFIELDS AND DISTRICT LITTLE ATHLETICS CENTRE - PLEASE SEE SEPARATE SECTION "HOW TO REGISTER - EXISTING MEMBERS"
You will be taken to a field where all personal details need to be completed – please ensure email address are correct as this is what shall be used to send out centre emails. Please ensure your child’s date of birth is correct. Select CORRECT age group for your child as per the date of birth range. Follow the relevant process through to payment. You will be emailed a password and username – keep this information for registration etc. Follow the process through to payment – a receipt will be emailed to you. Membership is not complete until payment is processed. - PLEASE REFER TO SEPARATE SECTION (ABOVE) "HOW TO REGISTER - NEW MEMBERS"
Press the ‘Log In” tab on the page just below the pictures of the children. site and enable you to confirm your child’s details and register. remembered one might be a good idea.